I do not know how to review this book, because I'm not sure what exactly this book was about. It's three stories about men who lose their wives and/or children and, thereby, lose part of themselves. They're filled with grief but must carry on in strange ways in order to try to heal. It's also filled with religious meanings, and I'm not Christian, so I'm not certain I picked up on all of them. 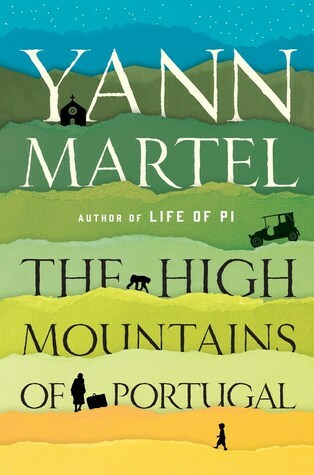 The stories are loosely connected both by characters and by location (the High Mountains of Portugal... which actually has no mountains). * How does someone who has experienced loss remain good and loving at heart (with no one left to love)? * Does walking backwards symbolize more--perhaps wanting to remember the past instead of trying to face a grief-filled future? * The man in the first story commits the one sin that hits him the hardest. After losing his child, he accidentally kills a child. Maybe an observation about fate/accidents? * He is so anti-religion that he laughs at the crucifix and calls Jesus an ape. But his act of killing this child has, we find out at the end, revived faith of so many in the town who thought that the way the child died was the doing of angels (instead of realizing he traveled clinging to the front of a car, they thought angels picked him up and accidentally dropped him miles away on the way to heaven). So he has revived a faith he detests. Does that make him an angel? * Is someone who loses so much automatically worthy of pity? Or does there need to be more to him? Does he need to continue to prove himself a good man in life? * If the Bible is actually a murder mystery--who killed Jesus?--does that mean that our lives could also be seen in that way? Is the murder mystery--who killed that little boy--supposed to be a direct comparison? And, if so, we can take it further. Disbelievers killed Jesus and brought about one of the most faith inspiring moments of the religion (Christ's rising from the dead). And in this story, a disbeliever killed a child who went on to inspire so much faith in others. * Are we all apes inside? Is that all men are? And if Jesus is an ape, maybe that's not a bad thing? Maybe it gets to the truth of it. For all we are, we're all still apes at heart, capable of love. And maybe only by embracing this and realizing this can we hope to come to a peaceful end in life? * The chimpanzee in the final story is definitely a Jesus figure. He has 12 disciples (dogs) who follow him around and interact with him. He also has a man who rescued him, saw the goodness in him, and learned from new ways of living from his silence and a vastly different perspective. * Maybe it's never too late to recognize the thing that can lead you to enlightenment? Never too late to find faith? Never too late to find your OWN interpretation/truth? * Are the connections in these stories just ENORMOUS coincidences or are they divinely constructed? Are writers like God? Must we have faith to make it through books like this?